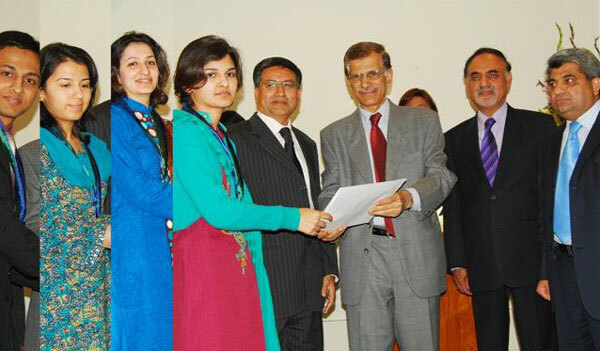 Pakistan Telecommunication Authority (PTA) has awarded gold medals with cash prizes to 12 students of various educational institutes of the country for the best research projects on IT & telecom for the year 2009. Secretary Cabinet Division, Abdul Rauf Chaudhry presented gold medals to the winners of the competition during a ceremony held at PTA Headquarters. Chairman PTA, Dr. Mohammed Yaseen, Member (Finance) PTA, Syed Nasrul Karim Ghaznavi, Member (Technical) PTA, Dr. Khawar Siddique Khokhar were also present on the occasion. The event was attended by faculty members of the universities, parents of the awardees and representatives of the industry. These gold medals have been awarded on the basis of a competition among accredited national universities called by PTA in April 2009 for the best research projects on IT & telecom. Various educational institutes responded to this call and nominated their students for the competition. Total 18 research projects were received from different universities which were later on scrutinized and evaluated by a PTA committee through a transparent procedure of marking. On the basis of highest obtained marks four research projects were selected for the award of Rs.50,000/- each and gold medals for the 12 participants of these projects. Just to mention, PTA’s Essay Writing competition (announced a year ago) is still to be concluded, in which hundreds of students had participated. its realy nice n good appreciation for the student and that kind of appreciation would realy be very helpfull to give the courage to the young generation to play their valeuable role in the society. It is indeed a good measure to establish linkage betweeen industry and acdemia through such competitions however it was not so good to see the distribution of a mere 50,000 rupee to each project team (on the average each team comprised of 3 members) in a country where players easily bag hundreds of thousand of rupee on showing their physical/sports skill only for few hours in a domestic cricket competition let alone the money awarded to team member only on participating in international level tournaments. It was also a pity to see a press release published on PTA website which appeared to be typical PR note to promote PTA image through the text and photos. PTA didn’t even bother to mention the names of the students and names of the institutions whose students won this competition. And here is the final and most interesting observation; there is not a single mention of what was the subject of the research of at least those projects that won the competition. Someone pls guide me, if this is not the case. My name is Nosherwan Shoaib. I have done by bachelors from Institute of Space Technology,Islamabad.The PTA has not mentioned institutes name and winners names. I have won Gold Medal and 50, 000 rupees for best project all over Pakistan by PTA. My project is “Design,Development and Fabrication of LNA at KU-band”.We are only two group members.The other member name is Mujeeb Ahmed from same institutes. If i am not wrong, you taught us calculus.